Honduras is located in Central America with a large coastline on the Caribbean Sea and a much smaller coastline on the Pacific Ocean. Nicaragua borders Honduras to the south, El Salvador to the southwest and Guatemala to the west. Honduras has been and continues to be relatively unstable and plagued by corruption, poverty and crime. 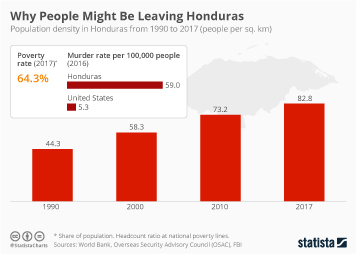 Unfortunately, the country also has by far the highest homicide rate in Latin America and the Caribbean, and the city San Pedro Sula, located in the northwest of Honduras, has more homicides per population than any other city in the world, except for Caracas, Venezuela. At present, Honduras has an estimated population of around 8.3 million inhabitants and more than half of them are living in urban areas. In ten years, the fertility rate in Honduras has dropped from 3.45 children per woman in 2005 to 2.51 children in 2015. This has reduced the annual population growth rate over the years, and despite the high number of homicides, the median age of the population is rising. Still, due to difficult living conditions and insecurity within the country, many inhabitants have also emigrated to the United States, with the largest groups living in Harris County, Texas and Los Angeles, California. Honduras' economy has been experiencing a yearly annual growth in the range of 3 to 4 percent each year, and is expected to continue on this path. However, much higher growth rates will be needed in order to help people out of poverty. Currently, GDP in Honduras is around 2,400 U.S. dollars per capita, and this amount is not expected to increase significantly in the future. Furthermore, not only is GDP per capita low, but Honduras also struggles with significant income inequality: While around 36 percent of the population continues to work in the agricultural sector, this sector only generates about 13.5 percent of total GDP. As Honduras attempts to diversify its economy - for example, it recently began exporting apparel products in addition to traditional commodities such as coffee and bananas -, increasing exports could help reduce its trade deficit and provide a better financial base for the country. Reducing dependence on the United States for both exports and imports may also help. However, addressing income inequality and crime is of utmost importance on the path to improving the living and economic conditions of Hondurans.